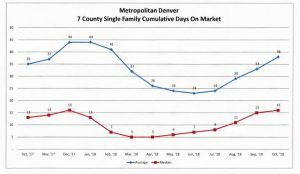 If you are looking for data and interesting facts in regards to the Denver real estate market… you have come to the right place! The Denver residential market currently hosts over 20% more listings than this time last year so it’s a perfect time to shop for your dream home or look for that real estate investment property you have been thinking about. Don’t forget that Jenni and Rosann, the R&R Team, specialize in Denver real estate each and every day! Give us a call if you have any questions or if you want a free evaluation of what your current home is worth.